* I received a copy of this book from Cider Mill Press to review. All opinions are my own and are not affected by how I acquired the book. What a great last minute gift idea! This book is SO cute and funny but also useful. You may be thinking how can a book be a reference and humourous. Well it’s possible. 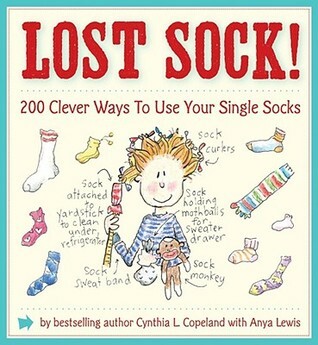 With over 200 uses for singleton socks plus lost sock anecdotes (such as quizzes, stories & brainteasers), ideas to stop you from losing them in the first place and adorable illustrations and diagrams. The ideas are categorized by type: socks for pets, socks for tots, socks with a message, socks in the garden, socks at play, socks in the car, dolls & socks, healing socks, safety socks, socks to protect and many others. Cut off the foot of two long socks and sew them to mittens. They’ll tuck under sleeves and stay on better than mittens alone. If you are painting and want to keep your shoes from getting splattered, slip single socks over them. Each idea is shown in point form and if the idea would be best with more colourful, pretty socks, it’s marked by a special sock icon. For example making toys or decorations would be better with nice socks than plain white with faded grey heels. Perfect for the thrifty crafter.